The STEEM price is up 9.32% verse the USD over the past 24 hours on higher volume ($15,257,100) as Bitcoin stabilizes at $8.6k and the broader market is up. 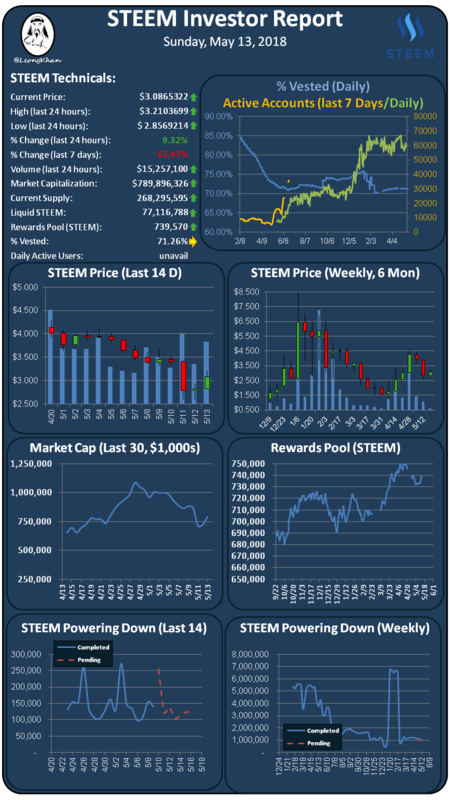 STEEM is holding ground verse Bitcoin as Korean trading continues to lead the trading volume with 44% of the trading volume. New account creation data is not available today. The % vested indicator is flat at 71.26% on steady power downs and lower power ups. Daily active account data is not available today. SBD is at $2.42 on Bittrex which is still very elevated over the peg, receive you rewards in 50% SBD and then use the SBDs to buy STEEM on the exchange. SBD conversions are a waste of money again! I want to invest but I do not know how to do it. You can buy STEEM through blocktrades directly or on a crypto exchange.